Last year sold out, don't wait to buy your tickets! Now 3 days! Banff Centre Mountain Film Festival is presented by Snowbasin Sports Education Foundation (Formerly the Ogden Valley Winter Sports Foundation). Come for adventure, for excitement, for the inspiration of mountain stories. Ignite your passion for adventure! The Banff Mountain Film Festival World Tour will exhilarate you with amazing big-screen stories when it arrives in Ogden at the historic Peery's Egyptian Theater. Journey to exotic locations, paddle the wildest waters and climb the highest peaks. Three days of screenings with different films at each screening. 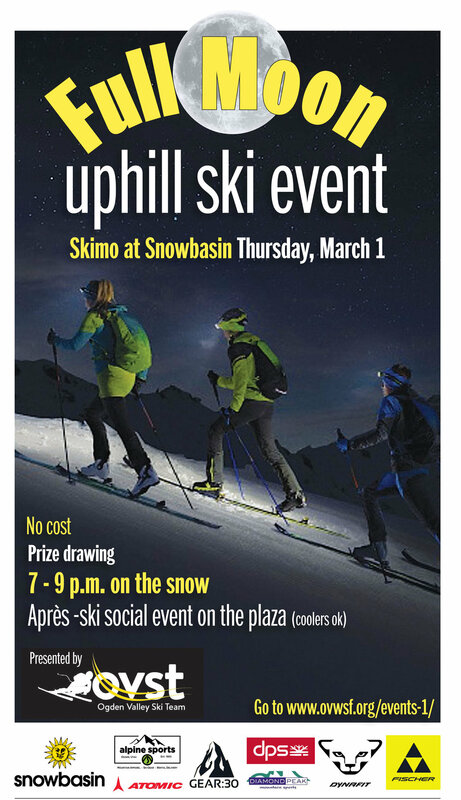 Get out under the Full Moon and skin up Snowbasin followed by a no host Apres-ski social on the plaza. 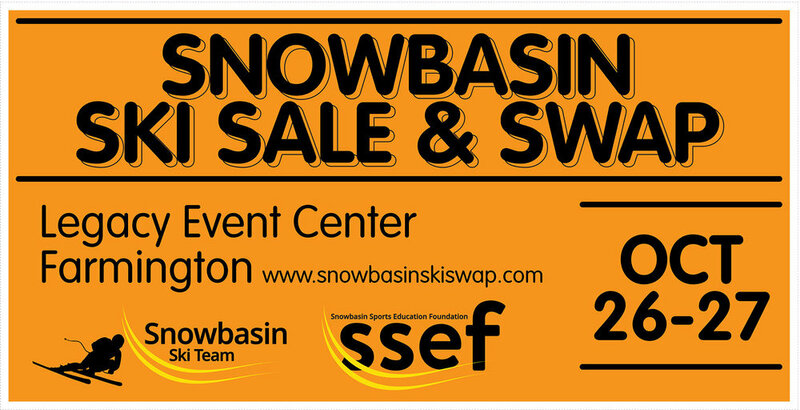 Brought to you at No Cost by Snowbasin Sports Education Foundation and Atomic. Front and Rear lights required, Normal upHill routes and rules apply. See Snowbasin Resort website for rules. PARTICIPANTS, PLEASE FOLLOW THESE IMPORTANT GUIDELINES FOR THIS FUN EVENT.. When traveling uphill, please stay in the middle of the trail. All uphill travelers must be equipped with lights, front and back when traveling in the dark. Only stop where you can be seen from above and below. No dogs are allowed on the mountain. Designated uphill route: Up Powder Puff to the bottom of School Hill, up Snowshoe to Bear Hollow and up Sweet Revenge to the Needles Lodge. Downhill must follow same route. 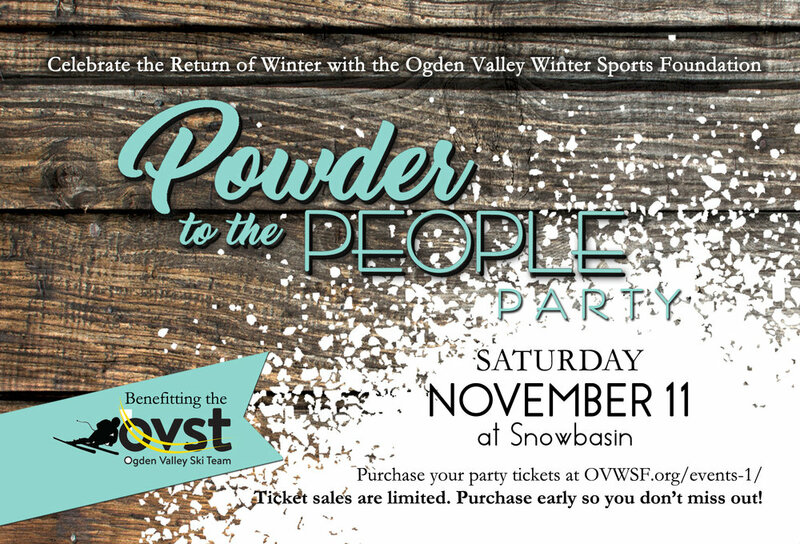 Please note - this is an Ogden Valley Ski Team event and is not hosted by Snowbasin Resort. Participation is at your own risk and participants must sign waivers. Anyone in violation of our uphill policy may be removed from the mountain and subject to fines, as well as jeopardize the future of uphill travel at Snowbasin Resort. Yield the right of way and stay clear of ski area machinery, i.e. grooming machines, snowmobiles and snowmaking equipment. You are responsible for your own safety. Expect to always encounter ski area machinery and employees at anytime and anywhere on the mountain. Mountain users should wear reflective clothing, headlamps and blinking lights on front and back. No pets allowed on the mountain. Please visit www.snowbasinskiswap.com for more details. Our Annual Golf Tournament has been rescheduled for May 8th, 2017 after postponing it due to rain. It is being held at the beautiful Ogden Golf and Country Club. We still have room for players and teams to join in on the fun. Don't miss this chance to win an Audi (2017 Etron 36 month/12k mi. yr. lease) with an Ace on #15, as well as many many other great prizes. Including: Hole-N-Ones for #2 – Travis Mathew – head to toe signature outfit + $500 online shopping spree, #7 –Luxurious 4 day/3 night golf vacation to French Lick Resort and hole #18 – Luxurious 4 day/3 night golf vacation to French Lick Resort. We'd really love to see more OVST support for this event. Please share with your friends and co-workers ( company). Most programs such as ours around the country have events like this throughout the year. Your support is paramount for us to continue to grow and improve as an organization.